I know this because every thrift store is buried in their tattered remains. Walk into any selected Goodwill and you’ll be challenged not to find a host of plastic instruments and microphones covered in cassette desks or discarded waffle irons. Chintzy, manufactured play instruments are worthless. Add Wii Fit into this bundle, Balance Boards hosted in a bygone corner of the store with a sickeningly low price attached. Gaming fads, it turns out, are just as pitifully short lived as superficial diet routines. Wii Fit is to Atkins what music video games are to mainstream poker popularity. Eventually, I will be able to return to this piece and replace most of this with Skylanders and Disney Infinity figures, mostly because thrift stores will become inundated with them. For those paying $130 for a small plastic figure, I have a Beanie Baby you may find of interest. But, at one point, Activision and Harmonix music games were invincible too. Harmonix shut down weekly Rock Band DLC releases only this year, trailing out into slow decline. It is inevitable with Skylanders and Disney Infinity too, even with bloated life spans. These will not be the final toy/game combinations. Why Nintendo is not stocking shelves with a Pokemon version is anyone’s guess, and other competitors will soon splatter shelves too. Remember Rock of the Dead? That’s how low music video games sank. Toy games will too if they hold to high acclaim. Kotaku did a hypothetical round-up of total launch costs for Disney Infinity and came up with a hair over $250, which assumes you’re buying new and not from eBay scalpers. It will undoubtedly heat up into Christmas, before the next year (or two) finds them alongside Tickle Me Elmos and Cabbage Patch Kids. No one can expect a little one’s attention to be held longer than marketing can hold out, or before market saturation dwindles appeal. And then… thrift stores. Goodwill and Salvation Army will need to dedicate sections of shelf space to plastic, sort of interactive figurines adorned with Disney iconography, all for pieces that will sell for a few bucks. 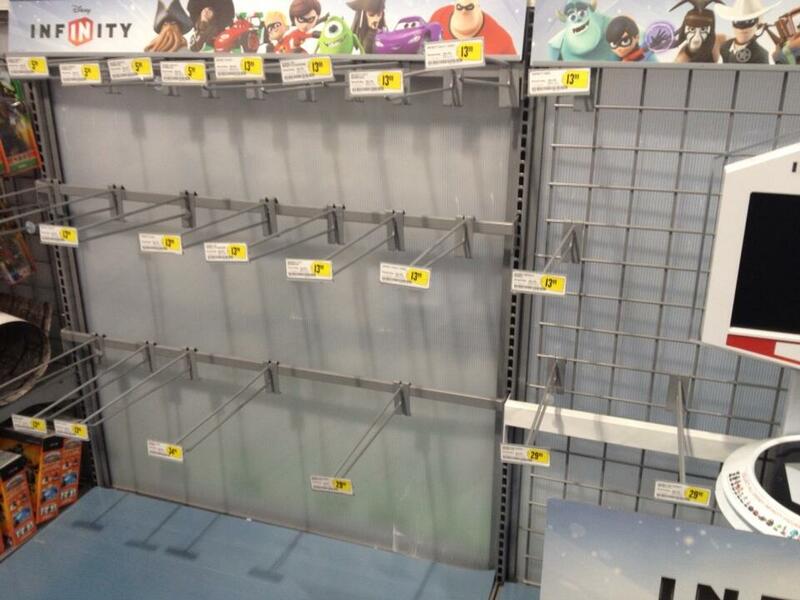 While I wish Disney Infinity success – Skylanders too – I also wish for intelligence to prevail. There will always be an audience with more money than sense; they splurge for a perceived rare figurine, gifting their privileged children. Disney collectors will leap in too. But, hopefully these out of control financial proportions show sensible control, and retail stores are not badgered for stock daily as delirious parents see a need to frantically source hot pieces. I, on the other hand, will enjoy watching and collecting from perspective and hindsight. If you’ll excuse me, my Furby is waiting on a Guitar Hero jam session under killer lava lamp lighting. Steam, PSN, and Xbox Live are hosting gaps where Activision's slate of Marvel licensed titles were once housed. Come out of a disappointing Summer of Arcade, we're recipients of a free Poker title and $15 retro remake. This attitude would be feigned ignorance within heralded halls of other entertainment media.